One can be excused for not noticing the Win Cinema, as it looks more like a house than a movie theater. 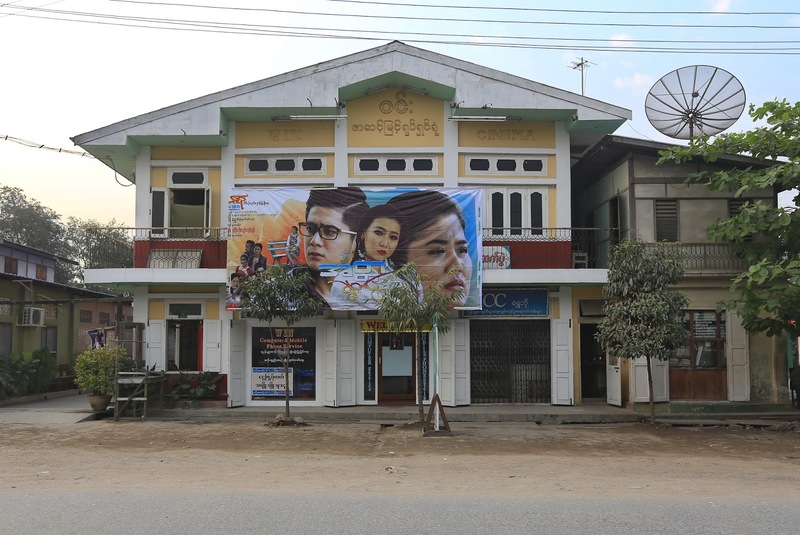 The humble neighborhood cinema hall - the last one operating in Shwebo - blends in to its residential block like a lizard on a leaf. 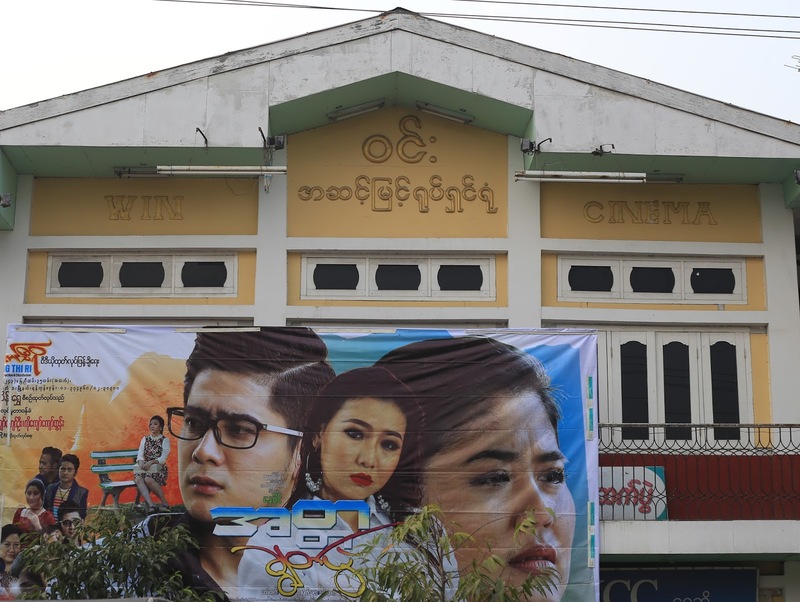 None of the telltale features of movie theater architecture, whether the Burmese variety or otherwise, announce its presence. Aside from its name, unassumingly molded onto the peak of the facade, only the large vinyl movie billboard festooned to its front betrays the silver screen that lies beyond. Beyond that it basically looks like a home. The ever humble and slightly Tudor-esque Win Cinema. A stroll down the side alley to the left of the building, however, reveals its movie theater organs. Here is where the show begins, where the ticket window, concession stands, poster cases and the like usher the movie goer into a world of escape. This demure little chasm has been, since 1963, Shwebo's entrance to the other. Ticket taker at the Win Cinema casually awaits customers while enjoying a cigarette and surfing the web. 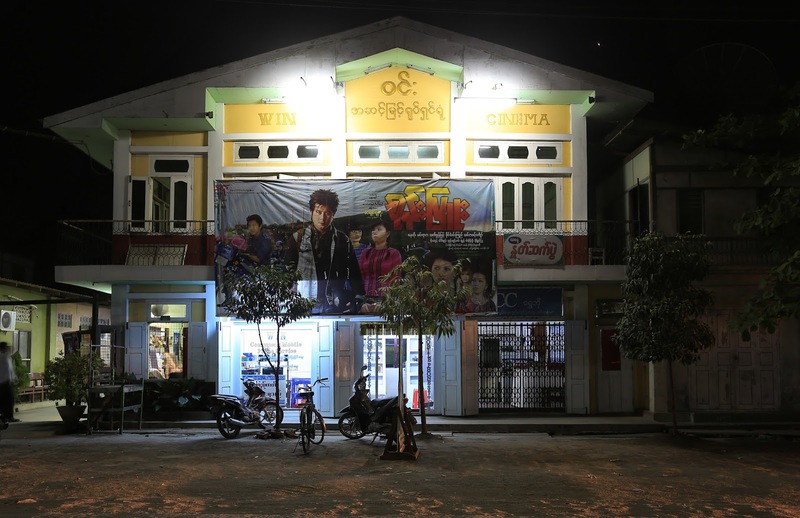 Living time capsules like the Win Cinema are fast disappearing from Myanmar's towns and cities. This is no big surprise. In the past few years, Myanmar society has arguably changed faster than it has in any other similar time frame in its history. In general, the technological and social changes which sweep relics like The Win into the dust bin of history are silent, rendering the loss little noticed. To the average person going about their daily lives focused on work, family, education, etc - the loss doesn't register until well after the fact. Suddenly, somehow, something causes us to think about it, we do the mental math and calculate how and why the thing disappeared. We come to conclusions - "it was nice while it lasted, but things are better the way they are now," or " life would be better if we still had that thing around." Either way the thing becomes an object of history, a morsel of legend to be bequeathed to next of kin and future generations, if it is remembered at all. Woven bamboo ceilings, exposed wooden truss beams and teak wood seats are some of the memorable details of The Win Cinema's very homey auditorium. If ever there was a theater that had the coziness of a house, it's The Win. Stickers on the backs of chairs. Whether or not anybody will ever lament the loss of a little neighborhood movie theater that looks more like a house, with a woven bamboo ceiling pierced by exposed wooded trusses, is yet to be seen. In March of 2016 it was still up and running, but how much longer it can remain so is the question. If it were to close down, it's doubtful that many folks in little Shwebo would think too hard about it. Most people might not even notice. In fact, a place like The Win would close simply because the people who were once regulars stopped coming, choosing to watch movies in more immediate formats. Only in hindsight will the loss be noticed. Projectionists manning the carbon-arc two-reel projectors, technology in place since the 1960's. But for now The Win Cinema carries on, a living relic of a recent past. Maybe as the world changes, the equation will rework itself favorably to The Win, and instead of a destiny of darkness, if will get a second wind and live on. It's nice to have these places around. Seasons greetings, theaterphiles. I hope you all rang in the new year exactly as you wanted to. Maybe there was one or two of you out there who celebrated the new year with a trip to a stand-alone movie theater. Or maybe not. 2017 is shaping up to be a productive year for The Southeast Asia Movie Theater Project. I feel I can say that with an ounce of confidence. 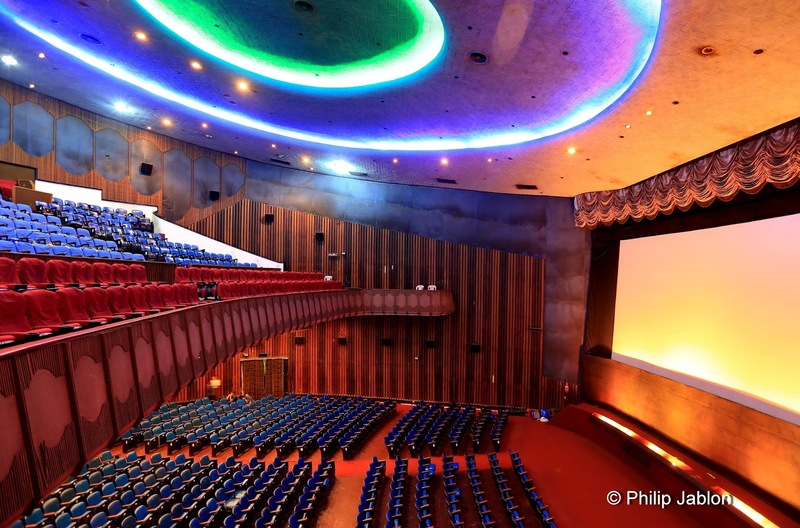 For one, Thailand is about to get its first full revival of a vintage stand-alone movie theater. If you ask me what that means I would say that the tide is changing for these classic structures after many years of steady attrition. Once this first one is on the record, we should start to see more money invested in old theaters as a means of bringing new life to old town cores. Mark my words! It will take some time, but if I know anything about Thailand, it's that once something is done to success it is quickly adopted elsewhere. Anyhow, more to come on that theater revival in due time. Second, after many years spent pounding the pavements of Thai cities in search of that elusive movie theater form, I've finally got a book coming out. In fact, text and photos are due to be submitted to my publisher this month, so I had better get cracking. Once I have an exact release date and all the finer details I'll let you know. I can tell you, however, that this book is going to be exclusively on the movie theaters of Thailand. Myanmar, Laos and elsewhere in the region will get their own books later. Third, later in the year I'm going to be working with a Thai filmmaker on a documentary about this project. The past two weeks were spent gathering preliminary footage, which will be edited into a teaser in the coming weeks. The rest of the filming will take place later in the years. Do stay tuned for that! 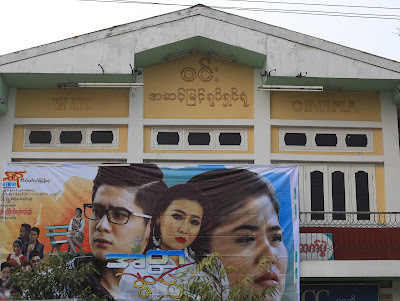 But before all else, I'm going to be making another survey of Myanmar's historic movie theaters this upcoming February. Last year's trip yielded some exciting new finds and was capped off by an exhibition at Yangon's pioneering Myanmar Deitta photography gallery. Above all, however, the trip opened my eyes to the full extent of Myanmar's vintage movie theaters, and that there are still many in seldom seen towns that need to be documented. A few of them are still in operation. 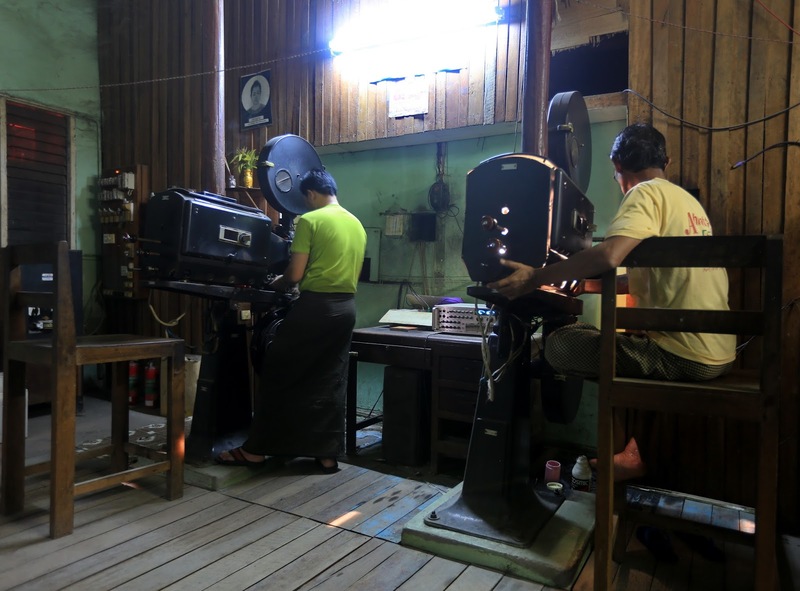 If you want to pitch in and help draw attention to Myanmar's enigmatic cinema halls, here's your chance. To help offset the cost of this trip, I'm selling a couple of photos and a t-shirt. The auditorium of Yangon's Thamada Cinema. Without a doubt, Myanmar's grandest and most luxurious active movie there. At 1,024 seats it's also probably the largest. This photo captures the Thamada's essence in an almost science fiction manner. The Aung Theit Hti Cinema in the city of Myaungmya, Irrawaddy Region. 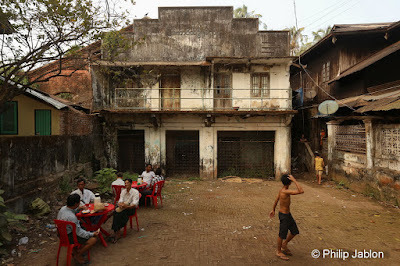 Although closed for the past 20 years, and allegedly inhabited by an enormous cobra, this humble mid-century movie theater makes for an interesting backdrop to a street side tea shop. Every evening people gather in its shadow to chat over cups of hot tea. The T-shirt is the result of a recent trip to Bangkok's dilapidated Prince Theater. While rummaging through a pile of debris in a corner of the theater, I came across this flyer advertising a Kung Fu movie from 1969. On the flyer was the theater's classic 1960's logo, which I have had printed onto a bunch of T-shirts. Each shirt is $15 or 3 shirts for $38. Free shipping within Thailand. For shipping outside of Thailand there's an additional $10 fee. Old flyer for the Prince Theatre, complete with vintage logo used on the t-shirts below. Either way, stay tuned for new posts about old theaters in Thailand and Myanmar. You can also follow my Instagram account at Phil Jablon or The Southeast Asia Movie Theater Project Facebook page.